Are you brave enough to unlock your free spins in this Halloween themed spookfest. Haunted Hallows is a light-hearted 3 reel. Match pumpkins and cats to unlock bonus rounds and ghostly Wilds. Mwhaha! This is where to play online slots! Eyecon gaming is a well-established online casino software developer which has created numerous gaming technologies and online slots. After their foundation in 1997, they now boast a repertoire of over 100 online slot games. Eyecon is involved in most areas of the online gaming industry delivering a range of services which include slot game and casino slot games development, live gaming, online casino management systems and online multiplayer games. Eyecon has partnerships with numerous developers worldwide. Some of their most popular slots include Fluffy Favourites, Jewel Journey, Irish Luck, and Frooty Licious. Haunted Hallows has several highlights including a simple gameplay interface and a few other ghostly surprises that all fit in nicely with the Halloween theme. The game might look simplistic, but you may be surprised to see how encapsulating it can get once you set foot among the ghostly reels. Visit the spooky house on a hill under a full moon surrounded by creepy looking pumpkins. The game contains 3 reels and 9 pay lines. We have created a list of best new slots to play for all sorts of players! Landing combinations of identical symbols across activated pay lines trigger cash payouts for the lucky players. Use the command control buttons to pick a wager and decide on which pay line to place if for your next spin. After a win, you can play a simple double-or-nothing mini-game, which is entirely optional. The higher a wager you decide to put into play, the larger your rewards can become in Haunted Hallows. Adjust your settings accordingly, and try out the auto spin game mode. This will let the reel’s spin on their own for a moment and speed up the gameplay a little. Haunted Hallows has a small selection of different reel symbols, which are the key to trigger your first cash wins. The basic winning combinations consist of 3 identical symbols on a pay line. The poison, black cat and ghost symbols are the most common in the game. You will get plenty of occasions to score a few wins with them, with increased rewards. The skull, Frankenstein and witch symbols may also appear in Haunted Hallows, these symbols are the rarest but bestow the most value. If you like spooky universes and surprise wins, then look no further than Haunted Hallows. 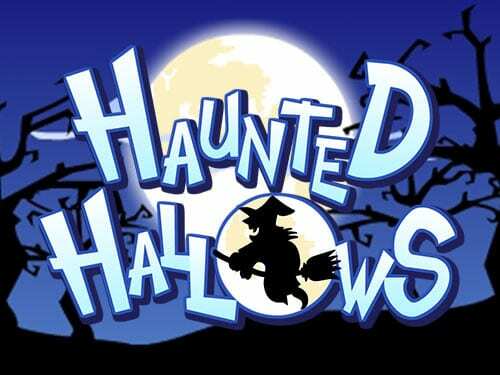 Despite only being a 3 reel slot game it certainly stands alone as one of the best Halloween slot games around. 3 reels have sometimes gained a reputation for being too simplistic, or maybe even the baby brother of the standard 5 reel. However, Hallows is a tremendous slot game with all the simplicity you’d expect coupled with the additional bonus games that come with your typical 5 reels. 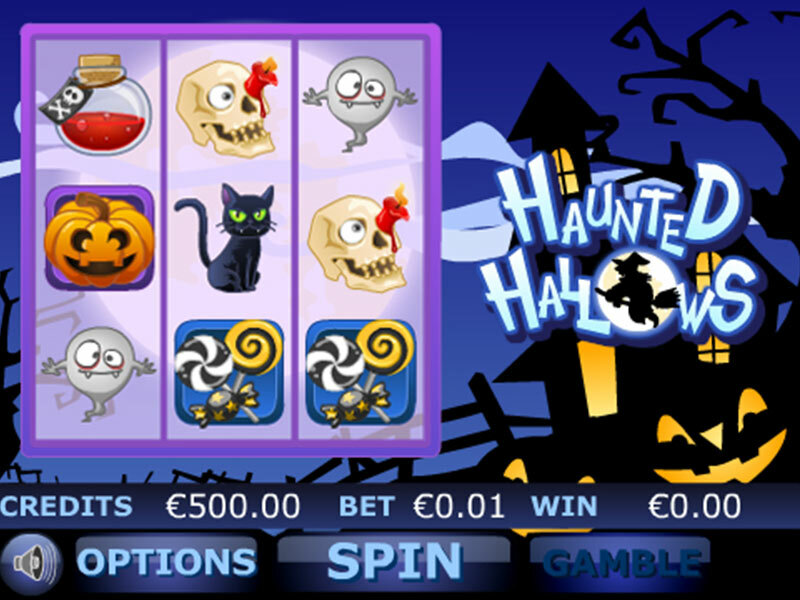 If you’re looking for a spooky night of slot playing collusion then don’t hesitate to deposit and win on Haunted Hallows.